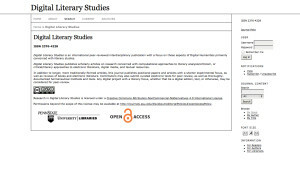 Digital Literary Studies publishes scholarly articles on research concerned with computational approaches to literary analysis/criticism, or alternatively, critical/literary approaches to electronic literature, digital media, and textual resources. In keeping with our departmental commitment to exploring new publishing models, in addition to longer, more “traditional” articles, Digital Literary Studies publishes positional papers and articles with a shorter experimental focus, as well as reviews of books and electronic literature. Contributors may also submit curated electronic texts for peer review. For example, a scholar might submit an encoded collection of poetry, which would be peer-reviewed, and stored in our institutional repository, ScholarSphere. Furthermore, we are interested in reviewing well-documented hermeneutical methods and tools, where the tools themselves are considered are a form of interpretation. Essentially, any digital project with a literary focus, whether that be a digital edition, tool, or otherwise, will be considered for peer-review. Content in Digital Literary Studies is published under a Creative Commons Attribution-NonCommercial-NoDerivatives 4.0 International license. The motivation for Digital Literary Studies emerged out of the decision by Oxford University Press to broaden the focus of the field’s major dedicated journal, Literary and Linguistic Computing. LLC recently underwent this transformation, moving from a specific focus on Digital Literary Studies to the broader field of Digital Humanities, a move which is reflected in its rebranding as DSH: Digital Scholarship in the Humanities.